UNICOIL® is available in sizes from 5mm to 50 mm in 12″ and 36″ standard lengths, with custom lengths available. Note: Paper thicknesses shown are general guidelines only. Papers vary depending on type and grade. 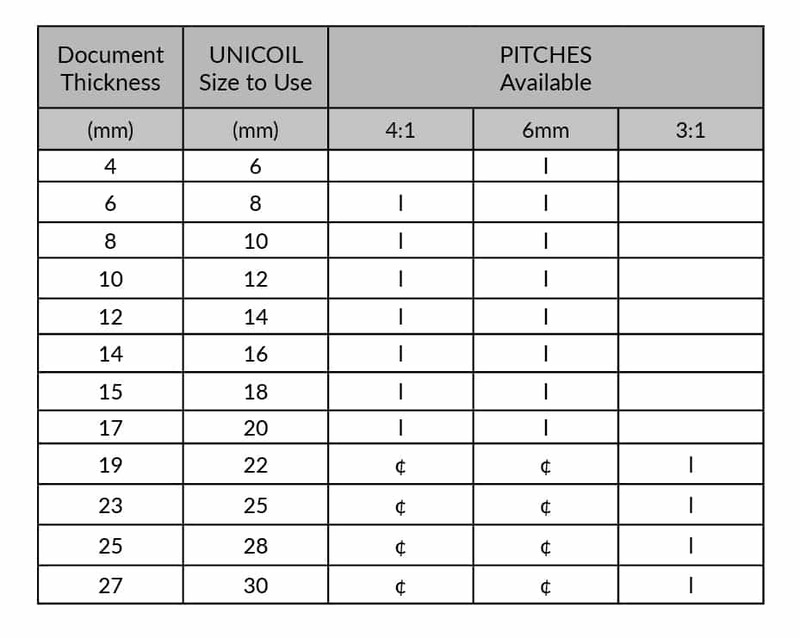 For an accurate estimate of the proper UNICOIL® size, measure an actual sample of the document to be bound and add 2mm to the actual thickness up to 14mm then add 3mm for 15mm and over. The chart above includes these additions. Coil sizes always refer to the inside diameter of the coil. l : recommended coil diameter in the pitch. ¢ : optional coil diameter in the pitch.